Danielle King of Pettisville (7) goes up for a block during a Division IV sectional final Thursday against Edgerton. The Blackbirds won in five sets to advance to the district tournament. HOLGATE – It by no means was the prettiest, but Pettisville was able to survive and advance, downing Edgerton 22-25, 25-19, 25-21, 19-25, 16-14 in a Division IV volleyball sectional semifinal Thursday at Holgate. The Blackbirds needed to make some plays down the stretch in the fifth set to pull out the win. Leading 13-8, Pettisville watched as the Bulldogs battled back with five straight points to tie the set. Missing one chance to win up 14-13, the Blackbirds capitalized on a second chance to win. Scoring a point when Edgerton was long on a hit, the Birds took the serve with the lead and won when Megan King’s serve didn’t come back over the net for an ace. It capped what had been a crazy match. 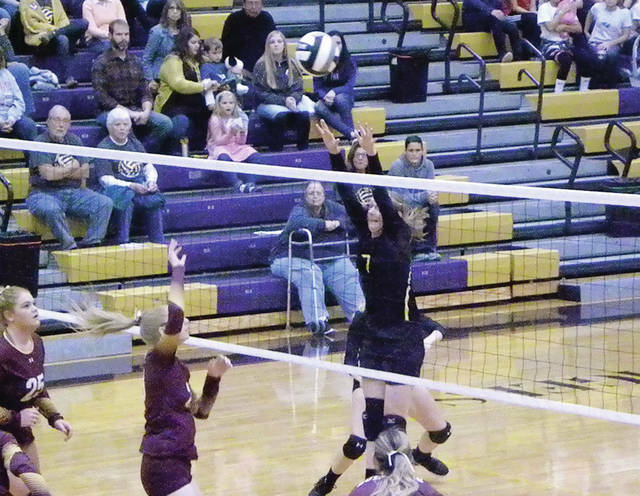 Down 21-14, Pettisville marched back in the opening set when King fired a pair of aces, Morgan Leppelmeier had a pair of kills and Danielle King closed a 7-0 run with a block. Back even, Edgerton closed the set with a run, getting a kill from Emma Siebenaler to win 25-22. Pettisville came up with a run to close out the second set. Clinging to a two point lead, the Blackbirds went on a 5-1 run, with Leppelmeier serving an ace in between five Edgerton errors. Edgerton lost a four point lead late in the third set. Up 21-18, the Bulldogs gave the serve back to Pettisville on a serve in the net, and the Blackbirds took over. Lepplemeier scored three points, getting the last two kills, with Megan King serving an ace in the winning run. Needing the win to stay alive, Edgerton played their best in the fourth set. Jumping ahead to an 18-11 lead, the Bulldogs closed the set and took the fourth set 25-19. Leppelmeier finished the match with 31 kills, 8 aces and 20 digs. Mikayla Graber added 42 assists and an ace. Danielle King had 26 digs and 5 kills. Megan King had 18 digs, 4 aces and an assist. Ryeana Klopfenstein had 13 digs, 10 kills and 2 aces. Anneli Shaw added 2 kills.